1 D None No Power Seat 1 D is a standard First Class seat however, the proximity to the stairs may be bothersome. 1 G None No Power Seat 1 G is a standard First Class seat however, the proximity to the stairs may be bothersome. 11 A None No Power Seat 11 A is a standard Business Class seat however, the proximity to the lavatory and bar may be bothersome. 11 K None No Power Seat 11 K is a standard Business Class seat however, the proximity to the bar may be bothersome. 13 D None No Power Seat 13 D is a standard Business Class seat however, the proximity to the bar may be bothersome. 13 G None No Power Seat 13 G is a standard Business Class seat however, the proximity to the bar may be bothersome. 16 C None No Power Seat 16 C is a standard Business Class seat however, the proximity to the galleys may be bothersome. 16 H None No Power Seat 16 H is a standard Business Class seat however, the proximity to the galleys may be bothersome. 17 D None No Power Seat 17 D is a standard Business Class seat however, the proximity to the galleys may be bothersome. 17 G None No Power Seat 17 G is a standard Business Class seat however, the proximity to the galleys may be bothersome. 18 A None No Power Seat 18 A is a standard Business Class seat, however, the proximity to the galley may be bothersome. 18 K None No Power Seat 18 K is a standard Business Class seat, however, the proximity to the galley may be bothersome. 24 E None No Power Seat 24 E is a standard Business Class seat. 25 H None No Power Seat 25 H is a standard Business Class seat. 26 E None No Power Seat 26 E is a standard Business Class seat. 27 D None No Power Seat 27 D is a standard Business Class seat. 27 G None No Power Seat 27 G is a standard Business Class seat. 27 H None No Power Seat 27 H is a standard Business Class seat. 28 E None No Power Seat 28 E is a standard Business Class seat. 28 F None No Power Seat 28 F is a standard Business Class seat. 29 C None No Power Seat 29 C is a standard Business Class seat however, the proximity to the lavatories may be bothersome. 29 D None No Power Seat 29 D is a standard Business Class seat however, the proximity to the lavatories may be bothersome. 29 G None No Power Seat 29 G is a standard Business Class seat however, the proximity to the lavatories may be bothersome. 29 H None No Power Seat 29 H is a standard Business Class seat however, the proximity to the lavatories may be bothersome. 31 A None No Power Seat 31 A is a standard Economy Class seat that has extra legroom however, the proximity to the galleys may be bothersome. 31 C None No Power Seat 31 C is a standard Economy Class seat that has extra legroom however, the proximity to the galleys may be bothersome. 31 H None No Power Seat 31 H is a standard Economy Class seat that has extra legroom however, the proximity to the galleys may be bothersome. 31 K None No Power Seat 31 K is a standard Economy Class seat that has extra legroom however, the proximity to the galleys may be bothersome. 32 A None No Power Seat 32 A is a standard Economy Class seat that has extra legroom due to the missing seat in front however, the proximity to the lavatories may be bothersome. 32 C None No Power Seat 32 C is a standard Economy Class seat however, the proximity to the galleys may be bothersome. 32 H None No Power Seat 32 H is a standard Economy Class seat however, the proximity to the galleys may be bothersome. 32 K None No Power Seat 32 K is a standard Economy Class seat that has extra legroom due to the missing seat in front however, the proximity to the lavatories may be bothersome. 33 C None No Power Seat 33 C is a standard Economy Class seat however, the proximity to the galleys may be bothersome. 33 H None No Power Seat 33 H is a standard Economy Class seat however, the proximity to the galleys may be bothersome. 36 D None No Power Seat 36 D is a standard Economy Class seat that may have restricted legroom due to the bulkhead. The position of the bassinet and proximity to the galleys may be bothersome. 36 E None No Power Seat 36 E is a standard Economy Class seat that may have restricted legroom due to the bulkhead. The position of the bassinet and proximity to the galleys may be bothersome. 36 F None No Power Seat 36 F is a standard Economy Class seat that may have restricted legroom due to the bulkhead. The position of the bassinet and proximity to the galleys may be bothersome. 36 G None No Power Seat 36 G is a standard Economy Class seat that may have restricted legroom due to the bulkhead. The position of the bassinet and proximity to the galleys may be bothersome. 47 B None No Power Seat 47 B is a standard Economy Class seat that may have limited recline. The proximity to the lavatories may be bothersome. 48 D None No Power Seat 48 D is a standard Economy Class seat that may have restricted legroom due to the bulkhead. The position of the bassinet and proximity to the lavatories may be bothersome. 48 E None No Power Seat 48 E is a standard Economy Class seat that may have restricted legroom due to the bulkhead. The position of the bassinet and proximity to the lavatories may be bothersome. 48 F None No Power Seat 48 F is a standard Economy Class seat that may have restricted legroom due to the bulkhead. The position of the bassinet and proximity to the lavatories may be bothersome. 48 G None No Power Seat 48 G is a standard Economy Class seat that may have restricted legroom due to the bulkhead. The position of the bassinet and proximity to the lavatories may be bothersome. 49 B None No Power Seat 49 B is a standard Economy Class seat that has extra legroom however, the proximity to the lavatories may be bothersome. 49 J None No Power Seat 49 J is a standard Economy Class seat that has extra legroom however, the proximity to the lavatories may be bothersome. 59 A None No Power Seat 59 A is a standard Economy Class seat however, the proximity to the galleys may be bothersome. 59 B None No Power Seat 59 B is a standard Economy Class seat however, the proximity to the galleys may be bothersome. 59 C None No Power Seat 59 C is a standard Economy Class seat however, the proximity to the galleys may be bothersome. 59 D None No Power Seat 59 D is a standard Economy Class seat however, the proximity to the galleys may be bothersome. 59 E None No Power Seat 59 E is a standard Economy Class seat however, the proximity to the galleys may be bothersome. 59 F None No Power Seat 59 F is a standard Economy Class seat however, the proximity to the galleys may be bothersome. 59 G None No Power Seat 59 G is a standard Economy Class seat however, the proximity to the galleys may be bothersome. 59 H None No Power Seat 59 H is a standard Economy Class seat however, the proximity to the galleys may be bothersome. 59 J None No Power Seat 59 J is a standard Economy Class seat however, the proximity to the galleys may be bothersome. 59 K None No Power Seat 59 K is a standard Economy Class seat however, the proximity to the galleys may be bothersome. 60 A None No Power Seat 60 A is a standard Economy Class seat that has extra legroom however, the proximity to the galleys may be bothersome. 60 B None No Power Seat 60 B is a standard Economy Class seat that has extra legroom however, the proximity to the galleys may be bothersome. 60 C None No Power Seat 60 C is a standard Economy Class seat that has extra legroom however, the proximity to the galleys may be bothersome. 60 D None No Power Seat 60 D is a standard Economy Class seat that may have restricted legroom due to the bulkhead. The position of the bassinet and proximity to the galleys may be bothersome. 60 E None No Power Seat 60 E is a standard Economy Class seat that may have restricted legroom due to the bulkhead. The position of the bassinet and proximity to the galleys may be bothersome. 60 F None No Power Seat 60 F is a standard Economy Class seat that may have restricted legroom due to the bulkhead. The position of the bassinet and proximity to the galleys may be bothersome. 60 G None No Power Seat 60 G is a standard Economy Class seat that may have restricted legroom due to the bulkhead. The position of the bassinet and proximity to the galleys may be bothersome. 60 H None No Power Seat 60 H is a standard Economy Class seat that has extra legroom however, the proximity to the galleys may be bothersome. 60 J None No Power Seat 60 J is a standard Economy Class seat that has extra legroom however, the proximity to the galleys may be bothersome. 60 K None No Power Seat 60 K is a standard Economy Class seat that has extra legroom however, the proximity to the galleys may be bothersome. 68 A None No Power Seat 68 A is a standard Economy Class seat in the last row of the plane. This seat may have limited recline. The proximity to the lavatories may be bothersome. 68 B None No Power Seat 68 B is a standard Economy Class seat in the last row of the plane. This seat may have limited recline. The proximity to the lavatories may be bothersome. 68 C None No Power Seat 68 C is a standard Economy Class seat in the last row of the plane. This seat may have limited recline. The proximity to the lavatories may be bothersome. 68 H None No Power Seat 68 H is a standard Economy Class seat in the last row of the plane. This seat may have limited recline. The proximity to the lavatories may be bothersome. 68 J None No Power Seat 68 J is a standard Economy Class seat in the last row of the plane. This seat may have limited recline. The proximity to the lavatories may be bothersome. 68 K None No Power Seat 68 K is a standard Economy Class seat in the last row of the plane. This seat may have limited recline. The proximity to the lavatories may be bothersome. 69 D None No Power Seat 69 D is a standard Economy Class seat in the last row of the plane. This seat may have limited recline. The proximity to the lavatories may be bothersome. 69 E None No Power Seat 69 E is a standard Economy Class seat in the last row of the plane. This seat may have limited recline. The proximity to the lavatories may be bothersome. 69 F None No Power Seat 69 F is a standard Economy Class seat in the last row of the plane. This seat may have limited recline. The proximity to the lavatories may be bothersome. 69 G None No Power Seat 69 G is a standard Economy Class seat in the last row of the plane. This seat may have limited recline. The proximity to the lavatories may be bothersome. 70 C None No Power Seat 70 C is a standard Economy Class seat that has extra legroom however, the proximity to the lavatories may be bothersome. 70 D None No Power Seat 70 D is a standard Economy Class seat that may have restricted legroom due to the bulkhead. The position of the bassinet and proximity to the lavatories may be bothersome. 70 E None No Power Seat 70 E is a standard Economy Class seat that may have restricted legroom due to the bulkhead. The position of the bassinet and proximity to the lavatories may be bothersome. 70 F None No Power Seat 70 F is a standard Economy Class seat that may have restricted legroom due to the bulkhead. The position of the bassinet and proximity to the lavatories may be bothersome. 70 G None No Power Seat 70 G is a standard Economy Class seat that may have restricted legroom due to the bulkhead. The position of the bassinet and proximity to the lavatories may be bothersome. 70 H None No Power Seat 70 H is a standard Economy Class seat that has extra legroom however, the proximity to the lavatories may be bothersome. 78 A None No Power Seat 78 A is a standard Economy Class seat in the last row of the plane. This seat may have limited recline. The proximity to the lavatories may be bothersome. 78 C None No Power Seat 78 C is a standard Economy Class seat in the last row of the plane. This seat may have limited recline. The proximity to the lavatories may be bothersome. 78 H None No Power Seat 78 H is a standard Economy Class seat in the last row of the plane. This seat may have limited recline. The proximity to the lavatories may be bothersome. 78 K None No Power Seat 78 K is a standard Economy Class seat in the last row of the plane. This seat may have limited recline. The proximity to the lavatories may be bothersome. 79 D None No Power Seat 79 D is a standard Economy Class seat in the last row of the plane. This seat may have limited recline. The proximity to the lavatories may be bothersome. 79 E None No Power Seat 79 E is a standard Economy Class seat in the last row of the plane. This seat may have limited recline. The proximity to the lavatories may be bothersome. 79 F None No Power Seat 79 F is a standard Economy Class seat in the last row of the plane. This seat may have limited recline. The proximity to the lavatories may be bothersome. 79 G None No Power Seat 79 G is a standard Economy Class seat in the last row of the plane. This seat may have limited recline. The proximity to the lavatories may be bothersome. AC and USB power ports are available at all First and Business class seats. Laptop power is not avaialble in Economy, there are only USB power ports avaialble. China Southern flies their Airbus A380-800 in a three class configuration with 8 First Class closed suites, 70 flat bed Business Class seats, and 428 standard Economy seats. 70ACHK have unrestricted legroom. Hand items have to be stored in overhead bins during landing and takeoff. Row 70 window seats have no window, and also no storing box like all other window seats in upper economy section. The wall is somewhat protruding towards the seat. Proximity to toilets does not bother. Best Business class seats of China Southern with all aisle access compared to some of their other aircraft. Food and service...well can be considered good for the money but that's it. If fly Economy try all you can, even paying a small fee, to get a seat in the upper deck cabin. As with all A380s with any airlines a super large Economy cabin normally means less attention - you wait almost an hour to get your meal, then another hour after you finish to have the tray collected. For Economy class seats I can't compare all types of aircraft but they are definitely much much better than those of their B787 Dreamliners. Do not pick this or 11A. Everyone that transits to the bar or the lav bumps into your seat, and at night the constant opening and closing of the curtain with light flashing on your face means you get no rest at all. 78 A/C & H/K should not be red seats. They fully recline and I was never bothered by passengers walking or proximity to the galley on a 15-hour flight. The cabin is small so not many people walking around. Plus, these seats are on the upper deck, which is better than any seat on the lower deck in my opinion. Keep in mind they block off the stairs to the lower deck, so if you want to take a "walk" to stretch your legs you are confined to the upstairs economy cabin. Submitted by jdp. Fantastic, roomy business class seat. Great food and cabin service. Best way to get from LAX to Guangzhou or beyond in China. Horrible, Don't choose this! Since this is an A380, I had high expectation regarding the passenger experience. However, CZ found a way to disappoint me. 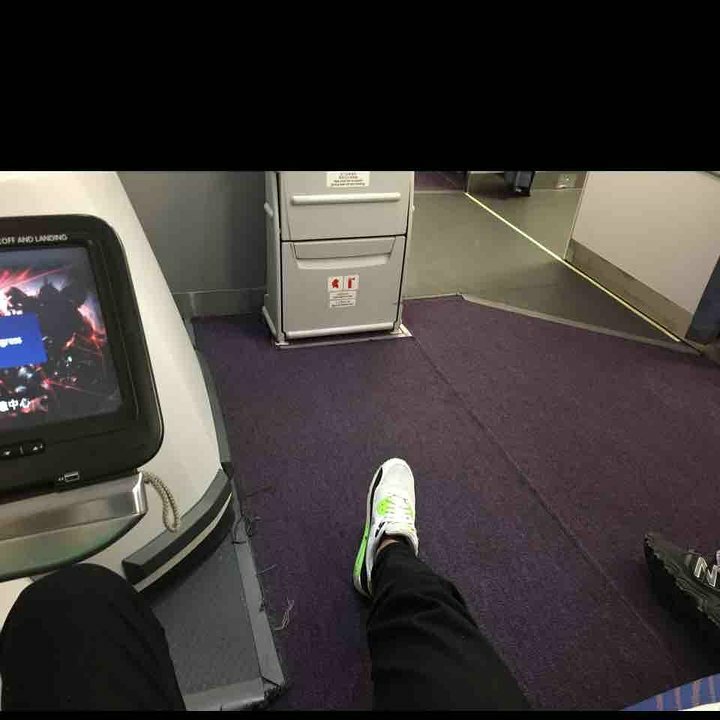 The leg room was so tiny and cramped, and I could hardly fall asleep during the 15 hour long flight from CAN to LAX. You don't find any place to put your knees. the experience was much worse than any other airlines. I would say: never, ever choose the A380 by CZ anymore. Took the lesson, stay away from it. Tray table and tv are stored between the seats. This makes the seat extra narrow. Also not allowed to watch tv during takeoff and landing like others in non-bulkhead seats. 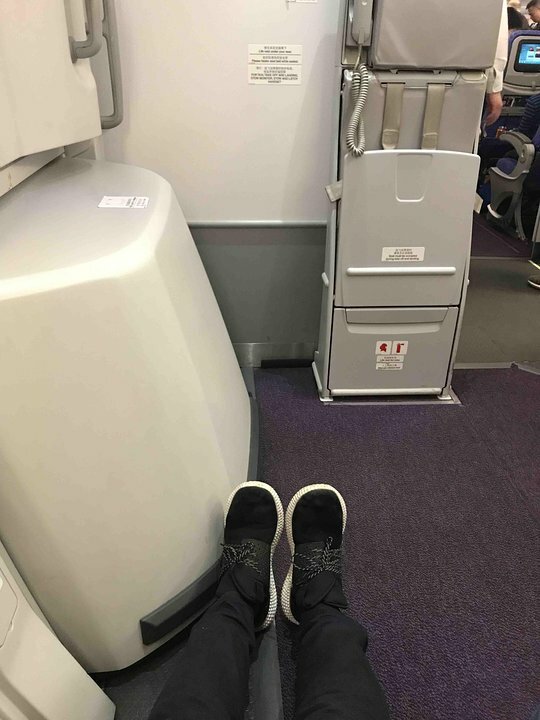 Great seat, 15 hour flight from LAX to Guangzhou, seat 24A. Very good inflight service and food. Wine and champagne are far from the best, but the ticket price is way cheaper than Singapore Airlines, Lufthansa etc. On my way back seat 20A was a bit battered and had some plastic noises when fully reclined. In general great deal for the price. 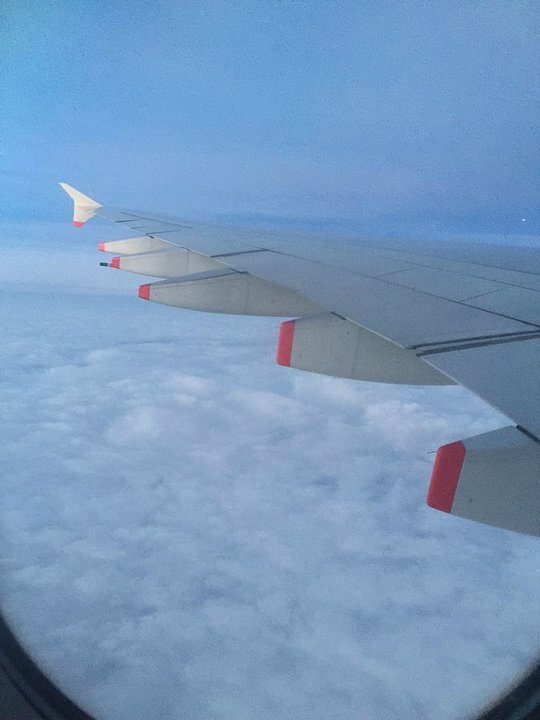 I was sitting on economy class. 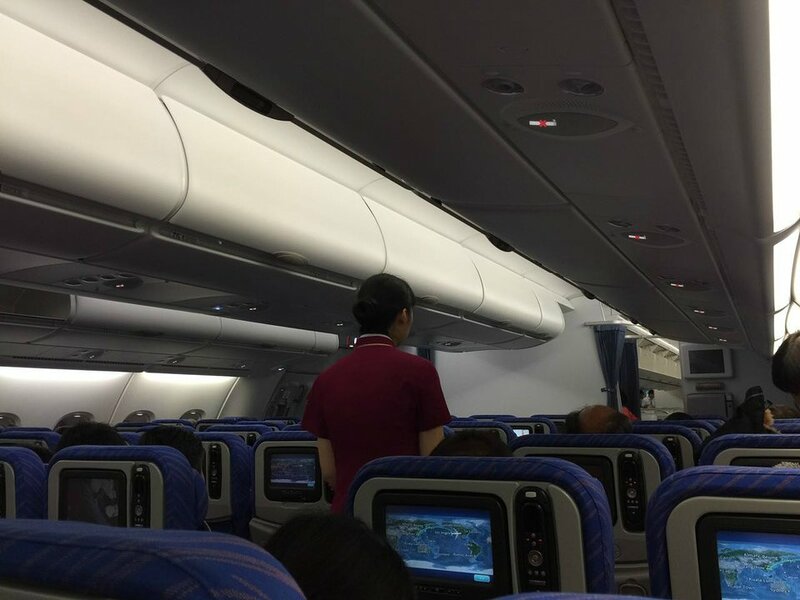 Flying from Guangzhou to LA takes more than 12 hours and found no USB power, let alone AC power. Since it is the cheapest flight, I have no choice but have to deal with it. The video monitor just only being used to monitor the flight progress. Luckily, I bought tablet/laptop that can be charged using power bank. Pretty much enjoy the movie I downloaded through entire flight. This is a great seat. All seats at the back of this A380 plane recline the same as other seats. This is one of a pair. 78K has access to a small locker beside your seat to store extra items. There is a bulkhead wall behind so there is nobody behind you to disturb your sleep. This is an excellent and private seat. Now cz leaves the belt sign the entir flight duration and they force you to power off the phone, even if flight mode exists. No USB power in economy. Limited film choice so if you fligth 15h and return, you have big chances of seen all movies in your language. Seats at the rear of lower deck have less room legs, really less. The seat is very hard. Window seat are far from window making impossible to use to lay on..
Travelled with CZ in Economy class between HKG-BJS in 2012. CZ's cabin crew & in-flight service on this flight of just under 4 hours was very good. The in-flght entertainment system was good but somewhat slow. Economy class Seating was standard but I must say quite hard. After sitting for over 4 hours ( all up ) I was glad to be off the seat. A long haul flight would be quiet challenging if the seats are still as hard. Couple things about these bulkhead seats -- you get all the extra leg room in the world. For an $85 upgrade on a 15 hr flight, definitely worth it. However, for the folks in the center bulkhead rows, that is where people traveling with infants can hook up a bassinet, so you are GUARANTEED to be next to a baby (happened on my return flight as well). Bring ear plugs and a mask. You are close to the bathrooms so, again, bring ear plugs and a mask. Also, the aisle seat is really narrow -- you have hard, solid seat separators on both sides that you can't move. I'm pretty thin and I found it uncomfortable. Anyone carrying more than 10 extra pounds would be really unhappy. The seats themselves aren't great, but about what I expect from an economy airline. I never knew an A380 could be uncomfortable, but CZ found a way. My economy seat in the last section of the upper deck was hard as a rock and very cramped. Fortunately, my flight was only from PEK-CAN. I can't imagine a long haul in a seat like this. China Southern flies 1 versions of Airbus A380-800.